Goulee made its debut with the 2003 vintage. At first, the wine was sold under the name of Goulee. That was later changed to Goulee by Cos d’Estournel. 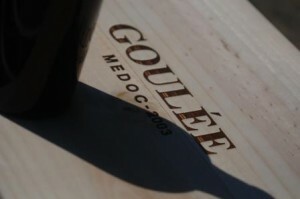 The wine takes its name from a small, local port, le Port de-Goulee, which is located in the northern area of the Medoc. The property can be difficult to find. To get there, you follow the D2 past Pauillac and continue heading due north, until you are a bit past St. Estephe to get there. The vineyards of Goulee are located on gravely hills that face the Gironde river. Goulee, which was at one time an island surrounded by the waters of the Gironde river, enjoys a terroir of deep layers of gravel in their cool soils. The vines are planted to a density of 5,700 vines per hectare. They use high trellising and high canopy management in their vineyards. The vineyard of Goulee is planted to 80% Cabernet Sauvignon and 20% Merlot for the red wine. Goulee also produces a small amount of white Bordeaux wine from a blend of 80% Sauvignon Blanc and 20% Semillon. The vines for the white wine come from a different terroir. 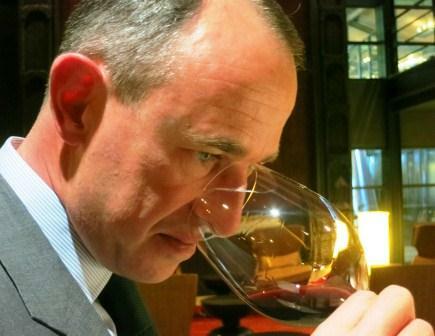 The wine of Goulee by Cos d’Estournel is vinifed at Marbuzet. The choice to vinify Goulee at Marbuzet, (a Cru Bourgeois Exceptionnel,) which is located close by in the Saint Estephe appellation was reasonable, as Marbuzet is also owned by Michel Reybier, the owner of Goulee and of course, Chateau Cos d’Estournel. To produce the red wine of Goulee by Cos d’Estournel, vinification takes place in temperature controlled, small, conical truncated shaped, stainless steel vats. The wine is aged in 50% new, French oak barrels. The production is close to 6,000 cases per year. Goulee Blanc, which is in essence, the second wine of Cos d’Estournel Blanc, is vinified entirely in barrel. There is no malolactic fermenetation or skin contact. The wine is aged on its fine lees. Because white wine grapes are not allowed by AOC law in this part of the Medoc, Goulee Blanc is sold as a generic. Bordeaux Blanc. Goulee by Cos d’Estournel is a ripe, forward, rich, fleshy style of Bordeaux wine that offers one of the better price to quality ratio’s in value priced Bordeaux. Goulee is produced by much of the same technical team that makes Chateau Cos d’Estournel. Goulee can be decanted for an average of 1 hour or so. This allows the wine to soften and open its perfume. Older vintages might need very little decanting, just enough to remove the sediment. Goulee by Cos d’Estournel is usually better with at least 1-3 years of bottle age. Of course that can vary slightly, depending on the vintage character. Chateau Citran offers its best drinking and should reach peak maturity between 3-10 years of age after the vintage. Goulee is best served at 15.5 degrees Celsius, 60 degrees Fahrenheit. The cool, almost cellar temperature gives the wine more freshness and lift. The wine of Chateau Goulee is best served with all types of classic meat dishes, veal, pork, beef, lamb, duck, game, roast chicken, roasted, braised and grilled dishes. Chateau Goulee is a perfect match with Asian dishes, hearty fish courses like tuna, mushrooms and pasta as well as cheese. The white wine of Goulee is perfect with all types of fish, seafood, shell fish, chicken, pork, veal and cheese dishes. Forward and round, the wine is all about the fruity entry and the sweetness harmonizing with a touch of olives and thyme on the back end. A blend of 72% Merlot, 24% Cabernet Sauvignon and 4% Cabernet Franc, this wine reached 12.8% alcohol. Forward, easy to like, plush, ripe, round, luscious and open, the licorice coated red fruits in the finish taste and feel great. Drink this now and over the next decade or so. Spicy, medium-bodied, fresh, forward with crisp, crunchy, sweet red fruits that will be ready to drink well on release, this wine was produced from a blend of 77% Merlot, 18% Cabernet Sauvignon and 5% Cabernet Franc, reaching 12.92% alcohol. Forward, easy drinking, fresh, yellow citrus filled, summer drinking charmer that will be best in its first few years of life. Forward, medium bodied, early drinking Merlot based wine, with round, textures and an open, red plum and cherry profile. Light in color, with a crisp, early drinking profile of bright lemon and citrus flavors. Medium bodied, refreshing and uncomplicated, this is a good summer quaffer. Forward, ripe, sweet and fresh, medium/full bodied, with sweet, dark chocolate covered blackberries and thyme from start to finish. This is already quite tasty, and it should be even better with time. Easy drinking, forward styled, fresh, juicy, white Bordeaux wine for early drinking pleasure. The wine is made from a blend of 80% Sauvignon Blanc and 20% Semillon. Licorice, coffee, toast, spice and blackberry in the nose. On the mouth, the wine is soft, fresh, sweet and tart, with licorice on the back end. Medium bodied, and easy to like, the black cherry notes and forward, soft, round textures make this an easy wine to taste. Dark in color and packed with licorice, blackberry and chocolate covered cherries, this forward, flashy wine already delivers pleasure. This is probably best enjoyed in its first decade of life. Ripe, easy to like, fat, juicy, lush and round, the vanilla tinged espresso, black cherry and licorice scented wine is already serving a lot of pleasure. From a blend of 80% Cabernet Sauvignon and 20% Merlot, the wine offers licorice, cassis, blackberries and earth notes. Sweet, ripe, round and open, this fun, easy to like, affordable Bordeaux wine will drink well on release. Light in color, with refreshing, lemon and citrus flavors. Medium bodied with good acidity, it's a wine I'd drink on the young side. Full mature, medium bodied, soft. fruity wine with licorice, tobacco and earthy accents to the red fruits. Drink this over the next few years, before the fruit fades. The wine was produced from blending 80% Cabernet Sauvignon and 20% Merlot. With a dark color and aromas of licorice, cassis, blackberry and smoke, this sweet, ripe, juicy and fun to taste wine should drink well early. Still showing some its licorice, black cherry, coffee bean and earthy personality, this wine has lost some of its vibrancy and juicy fruits with time. However, the round textures are still present in the finish.